Our single blue star auto magnet is proudly made in the USA and can help you show your pride wherever you go! 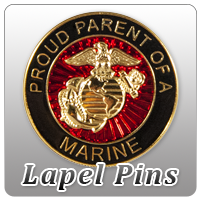 Its sturdy, high-quality magnet stays where you put it, and the bright colors will last to show your support for our Marines! With two sons and a nephew in the Marines I have a two star and a one star banner on my car. They are an honor to display. They look great and are holding up well. The magnet looks very nice and seems sturdy. My problem is not much metal in the right places of my car to display it. Once having found a place, it is staying on nicely.